Orion I/O is designed for high performance 12V dc to 125V dc monitoring and control applications in electrical substations including 1ms SOE Recording, circuit breaker TRIP/CLOSE, higher-speed control, and analog transducer monitoring and measurement. Although Orion I/O can stand-alone and operate as an independent RTU, it is usually connected serially or with Ethernet to an OrionLX™ or other substation RTU. The 16-Point Discrete Input Card in Orion I/O monitors the position, status, or health of substation apparatus such as circuit breakers, reclosers, transformers, tap changers, and capacitor banks. The 16-Point Discrete Output Card energizes TRIP and CLOSE coils in circuit breakers and reclosers, or switches other loads. The 8-Point Analog Input Card monitors and measures transducers signals representing amps, volts, watts, vars, frequency, etc. NovaTech Orion I/O™ is an extension of the family of OrionLX™ Automation Platforms for substation automation and incorporates the same security features, software tools and “NCD” configuration as the OrionLX. 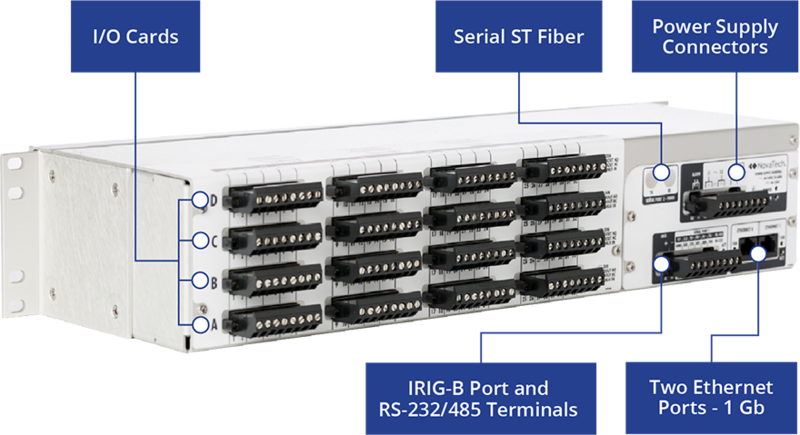 It is a rack-mountable I/O assembly with four slots—A, B, C, and D—that can be filled with any combination of I/O cards: currently 16-Point Discrete Input Card, 16-Point Wetted Discrete Input Card, 16-Point Discrete Output Card, and 8-Point Analog Input Card. Full population of discrete cards yields 64 I/O in 2 RU (rack units); full population of analog input cards yields 32 analog inputs. See Figure 1 below for rear connections on Orion I/O. A standard, conventional faceplate is also available. 1ms SOE Card with 16 inputs. High range (125V dc) or low range (12-48V dc) selection in software. 1ms SOE Card with 16 wetted inputs. 24V dc or 48V dc sourced directly from card, and selected in software. Orion I/O provides two copper Ethernet ports (separate NICs). In Phase 2, two LC fiber ports with separate NICs will be optional, as will be copper and LC fiber switch options (one NIC, two ports). A PRP/HSR redundancy option will also be available. Orion I/O is also available with one RS-232/485 serial port. Webpage software provides selections for full or half duplex, and termination resistor. IRIG-B can be received from an OrionLX RTU on RS-485 terminals. A second serial ST fiber port will be available in Phase 2. Screw terminals are provided to accept unmodulated IRIG-B. Precision Time Protocol (PTP) will be available in Phase 2. 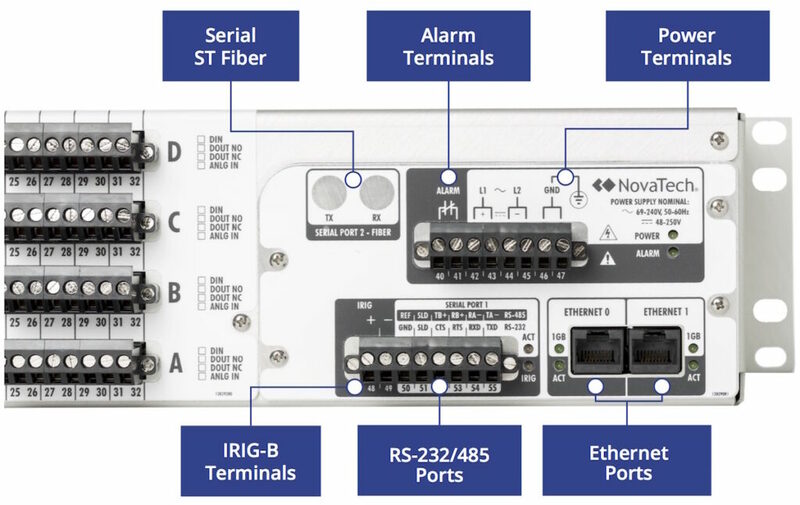 The image below shows Ethernet ports, communication ports, a serial port terminal, power terminals, alarm terminals, and IRIG-B terminals. 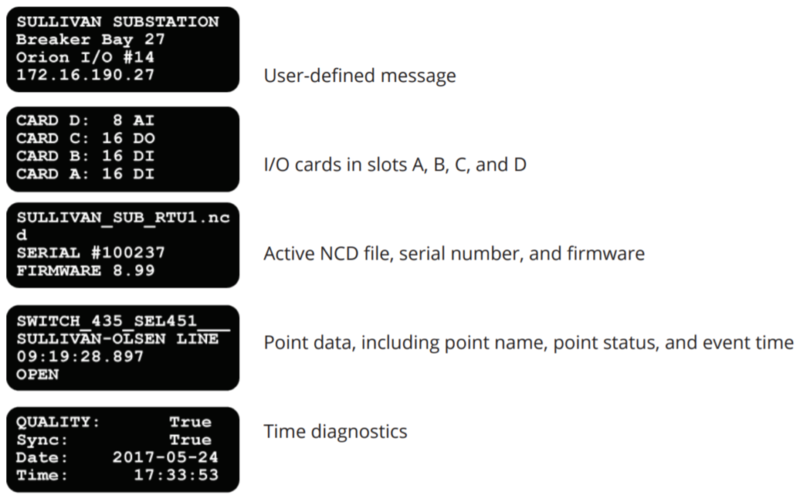 Security Monitoring Points indicating who is connected (by username) and how they are connected (HTTPS, Front Port, SSH, etc.). These points can be mapped to SCADA or to an alarm log. Datasheet summarizing the components and options for replacing legacy GE D20 Substation I/O units with pre-wired and tested Orion I/O retrofit assemblies. Learn more about High Power Output for Orion I/O and Orion Syslog, Watch the new D20 Upgrade Video! Quick review of how to configure the Orion IO as an stand alone IED that can be polled by a DNP Slave device.